Below you will find information and common questions – remember, if you need anything else or have additional questions don’t hesitate to contact us (click here for contact information)! How do I hold and confirm a wedding date? What is the limit on number of guests for weddings? Do children count as guests? Does our wedding package include a gratuity? Can we provide our own music for the wedding? Can a family member video our wedding? Will we have a unity candle in our ceremony? Are there other local accommodations for our guests? Is there a restaurant close by that we could take our wedding guests to? Where do the Innkeepers of Butterfly Hollow Retreat live? Can our minister perform the ceremony? Do you provide any wedding favors? Are there any local beauty salons to have my hair and/or makeup done? Do high heels work well for outside weddings ? How do I hold and confirm a wedding date? To hold a date for a wedding or vow renewal ceremony we require a 50% deposit, which can either be by check, PayPal or credit card. Once you have requested to hold a date either via phone or email, we’ll send you an email with the details of your wedding package and the deposit amount. There will also be a link within the email if you would like to take care of the deposit online. Once your reservation has been confirmed, we’ll follow up with an email confirmation that will include links to some more helpful wedding planning web pages. The balance for your wedding package will be due 60 days before your arrival date. What is the limit on number of guests for your weddings? 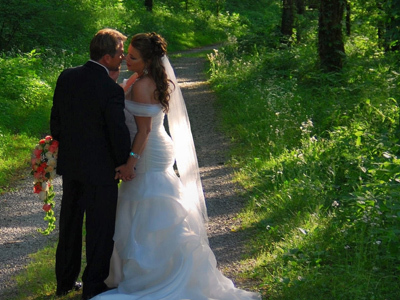 All of our wedding packages have a predetermined number of guests included in the price. For a nominal fee of $20.00 per guest you can add to each package as long as your total guest count does not exceed 30. This limit is primarily due to our insurance guidelines, but also the intimate nature of our valley and size of the farmhouse. We wish we could share Butterfly Hollow with more of your family and friends, but having this comfortable number will also help keep your wedding celebration simple, personal and stress free. The only exceptions are when you provide your own officiant or photographer. They do not count in your guest limit unless they stay for your reception. Do children count as guests? Yes. An infant under 2 would be the only exception. Does our wedding package include a gratuity? No. Dave and Beth Ann do not believe an automatic gratuity should be added to any of their packages. They believe it should be a decision left up to you based on the level of service received and the overall satisfaction of having your special day at Butterfly Hollow. Can we provide our own music for the wedding? Absolutely! You would be more than welcome to bring your favorite music on a downloadable playlist. We have a portable sound system that you can use via Bluetooth. If you do not have any musical preferences we have a wide variety of instrumental music for the ceremony. If you have reserved the Intimate Hollow Wedding or Celebration package you might also like to consider hiring a live musician for your ceremony. Violin, guitar, or cello are truly magical. What will we do if it rains? For weddings in Butterfly Hollow, we can still have a beautiful, cozy ceremony with flowers, candles and natural touches on the covered wrap around porch of the farmhouse or in our open air barn. Can we bring champagne for our reception? Sure. Due to local laws and regulations we currently cannot sell or provide alcohol. Since this is a private function, you are more than welcome to bring your own or hire a licensed bar service. Can a family member video our wedding? Most definitely!! We do recommend the professional services of Colby Mac Productions. Please email or call for additional information on their Butterfly Hollow Specials. Will we have a unity candle in our ceremony? We would like the ceremony to be a reflection of you and your love story. If you would like to include any of the wedding traditions, like the Unity Candle or add something a little non-traditional – that would be wonderful. Since most of our weddings are outside, you might also look into a few of the alternatives such as a sand ceremony. Are there other local accommodations for our guests? Yes, there is a local hotel about ten minutes away, several B&Bs, rental cabins and state parks very close by. Several standard chain hotels to choose from are within a 25 minute drive in Lebanon. Once your reservation has been confirmed, we will send you more information and contact phone numbers for some of these lodging alternatives in our confirmation email. 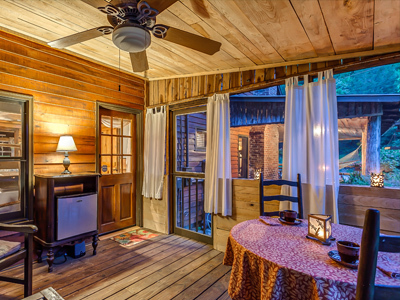 With most wedding packages (Celebration package not included) we have our 2 bedroom/2 bathroom log cabin available for rent. This is separate from the B&B but on the grounds of Butterfly Hollow. Is there a restaurant close by that we could take our wedding guests to? There is a wonderful restaurant called The Timberloft, which is about ten minutes away from the Hollow. It has a warm, rustic lodge feel, a lounge, patio dining and a menu filled with delicious entrees. Also near by is The Galley, which is a Floating restaurant on the Center Hill lake, Outback Steak House, The Blue Water Grill, Demos Steak House and many other dining choices twenty minutes away in Lebanon. There are few others listed on our area attractions page. Where do the Innkeepers of Butterfly Hollow live? Dave, Beth Ann, and their family live nearby. Dave, who is the master chef of the family slips into the Hollow usually early in the morning and begins breakfast preparations while guests are slowly waking to the smell of fresh coffee. 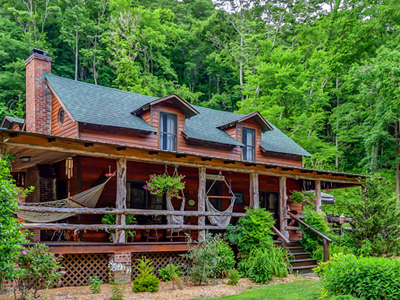 The Innkeepers pride themselves in providing a relaxing atmosphere and encouraging heartfelt conversation, but also in letting their guests feel like they can be alone and enjoy the Hollow, listen to the birds, and find solitude in nature. Can we say our own vows? Most certainly. If you would like to include any special prayer, traditions or non-traditions into your ceremony, that would be wonderful. We want your wedding to be a reflection of the two of you. We do have a list of many sample vows and ceremony ideas, if you would like a little inspiration, which we also include in the confirmation email. Can our minister perform the ceremony? Yes. You are welcome to have your own officiant perform the service. In order for the ceremony to be legal through the state of Tennessee, you must of have a licensed individual such as an elected official, county clerk, or ordained through a religious organization. All of our wedding packages, where the minister or officiant is provided by Butterfly Hollow, are legally binding and will be filed in the county where you received your marriage license within three days of your wedding. Do you provide any wedding favors ? You would be welcome to bring along any gifts that you would like to share with your family and friends. We do sell Butterfly Hollow coffee mugs or wine glasses which can be supplied with ample notice as we only carry a limited supply on property. Are there any local beauty salons so I can have my hair/makeup done? Yes. There are several salons and beauty shops within a ten minute drive of the hollow. The confirmation email that you’ll receive after your reservation is made will list all of them along with their contact numbers so that you can make an appointment. Do high heels work well for outside weddings? Heels can be a bit challenging, especially if the ground is soft or wet. Wedges work the best, though we have had many brides wear sandals, flip flops, or go barefoot. If high heels are a must, then you might need to pack along a little sense of humor too, or perhaps bring along some comfy shoes to walk around in and then slip into your heels at the wedding spot.